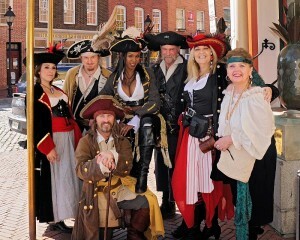 So the second weekend of March, 2010 saw me at the Fell’s Point Privateer Day in Baltimore, MD. This was my first year attending this event, although I’d certainly heard good things. I was, however, a little concerned that a Privateer “Day” might not quite be robust enough to justify a long distance journey. Thanks in large part to Pirates Magazine and the Devil’s Dozen Induction, I needn’t have worried. Seriously, how could you NOT want to party with these folks? You're buying the first round. Photo by Poppa Ratsey, without whom none of us would remember anything about most of these events. The festivities began “unofficially” on Friday night with the Order of Leviathan Devil’s Dozen Induction Ceremony, which I’ve already discussed extensively. It was a fine, fun time, and an excellent way to start the weekend. Immediately following was Swashbuckler Soiree, only a few blocks away. Where the Induction Ceremony was strictly a pirate audience, the Soiree was a mix of pirates and non-pirates, although most of the non-pirates still did their level best to look pirate-party-appropriate. Local restaurants provided an excellent assortment of food, and music by The Brigands and Inishowen added to the festive atmosphere (The Brigands are a band that I’ve actually played on Bilgemunky Radio for some years now, but I gotta say that if you’ve never seen them live, you’re missing half the fun – no CD can capture the energy of their live performance). While the Soiree lacked the Induction’s exclusive pirate atmosphere, it did allow for a more casual opportunity to meet up with friends before the festival began “in earnest” the following morning. Being a privateer day, Saturday was the true bulk of the scheduled events. 30 or so vendors were set up in the town square, while the HMS Bounty and the Pride of Baltimore were docked alongside. Two outdoor stages hosted a range of entertainers, including The Brigands, Captain Thomas Flint, the Valhalla Pirates, and some Q&A time with Vince Lozano and Treva Etienne of Pirates of the Caribbean. There was also a first-rate historical encampment, although it was just removed enough from the casual line-of-sight that I worry not all patrons knew to visit it. As festivals go, Fell’s Point is decent. The vendors were sadly lacking for anyone with much experience in the pirate circuit, being mostly geared to the local family sort of shopper (inflatable swords, scented candles – that sort of thing.) There were a few exceptions worth note, including the Pirates Magazine Booth which featured the wares of several worthy pirate artisans (Baltimore Knife & Sword, Quicksilver’s Pirate Pots, No Quarter Given, etc.) However, what the festival grounds might have lacked, the simple magic of having a few hundred pirates in a waterfront town with a large number of local watering holes more than made up for. Drinking rum all day is great fun, but even more-so when done alongside other piratey sorts that you haven’t seen in years, or are only meeting for the first time. Bilgemunky and Treva, after a few too many. Photo credit to Kendra Guffey, who likely hoped to extract some sort of blackmail. Daytime festivities were largely drawn to a close by a ship-to-ship battle between the Bounty and the Baltimore. Being as I was crewing the Baltimore, I can’t say how the skirmish looked from ashore (but I imagine it looked like we pirates handed the navy their royal buttocks on a platter.) Upon docking, precious little time remained to scrounge up some dinner before the evening Pub Crawl began in force. According to the schedule, no less than 17 local bars were participating with drink specials – many of them involving Pussers and Goslings (two of my all-time favorite rums.) The crawl had no central leadership or structure, so pirates were left to wander from bar-to-bar as they saw fit – my own group hit maybe three or four before we began to wonder where the evening had gone, and found ourselves merging with other folks in the middle of the town square to finish off the night (and our bottles) with pirate song, random chatter, and candid pictures that will surely haunt us for the rest of our days. 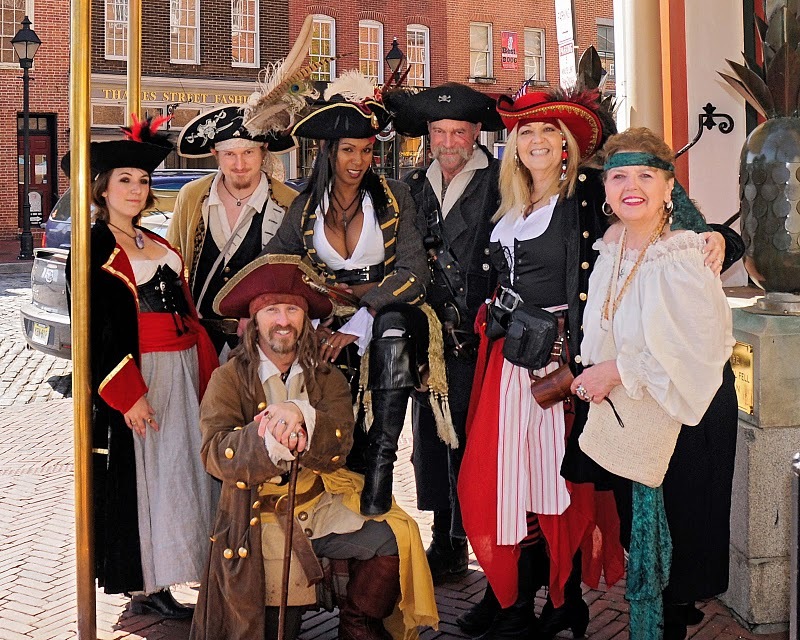 Fell’s Point Privateer Day (Weekend) was indeed a blast, although I’m unclear as to where the official Festival ended and the Pirates Magazine/Order of Leviathan supplemental events began. For the purposes of 2010 one could merge into the next and it would hardly matter. But last I heard, the Order of Leviathan may well migrate between events for future Induction Ceremonies, and this could spell the difference as to whether Fell’s Point is a must-hit event for the long distance traveller. 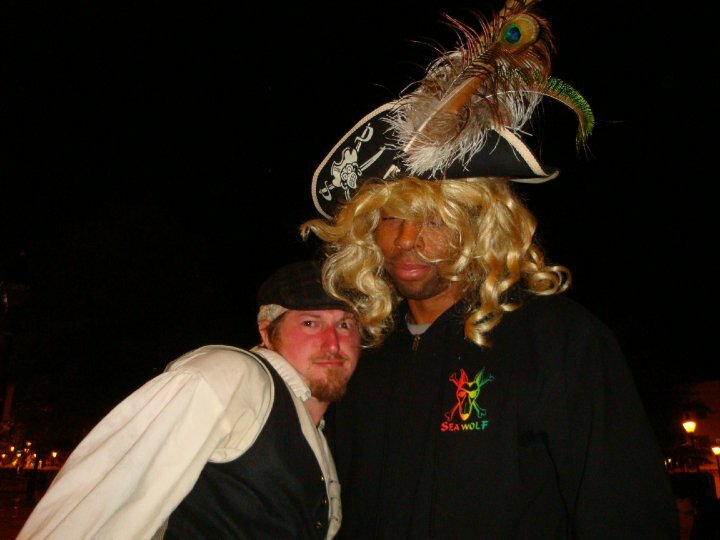 It was indeed the day and a half of partying that made the weekend so grand, and might well be lacking should Pirates Mag and Leviathan turn their attentions elsewhere in 2011. Or perhaps not, if Fell’s Point manages to expand their format on their own. Whatever the case, Fell’s Point is definitely one to watch – 2010 was overflowing with piracy, rum, and great times, and it will be worth monitoring how 2011 shapes up over the coming year! This entry was posted in Commentary and tagged fells point, order of leviathan, pirates magazine by Bilgemunky. Bookmark the permalink. This was me firat tyme at this event and it be quite KOOL,indeed Let’s hope that it will continue next year in the same mode of Pyrate Fun,Lots of Rum,Wenches and some good ol’Pyrate Debauchery as well. Looking forward to next Year. Hope Pirate Mag keeps it at FellsPoint,yada,yada,yada,Later me fellow scallywags and of course to those ever so beautiful Wenches!! !Le Marquis LaVasque—-Les bon temps,toujours!!!!! Moi? Use for blackmailing? Nahh… Thanks for the photo credit Bilge! I had a great time in Fells Point and look forward to drinking rum with you again. as for blackmail- I have WAY better stuff than that from the weekend on all sorts of people. 😉 Should keep me in free rum for a while.